PowerPoint presentation used to train ICOTS end users. 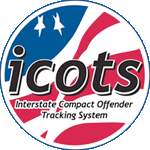 The ICOTS End User Training PowerPoint presentation provides an overview of all major processes and functions used by an end-user such as initiating activities, managing workload and offender profiles as well as case management. Looking for Live Training? Training requests can be made in accordance with the ICAOS Training and Technical Assistance Policy.